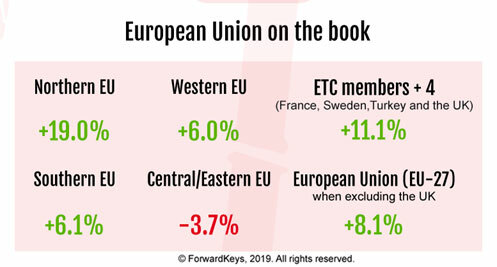 European Union destinations are ahead 9.2% compared to last year, according to latest findings from ForwardKeys which predicts future travel patterns by analysing 17 million booking transactions a day. The substantial increase in visitors is well above the global average which is 0.2% up on 2018. 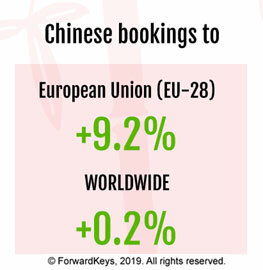 The EU welcomes an early crowd of Chinese travellers two weeks before the Golden Week in 2019. 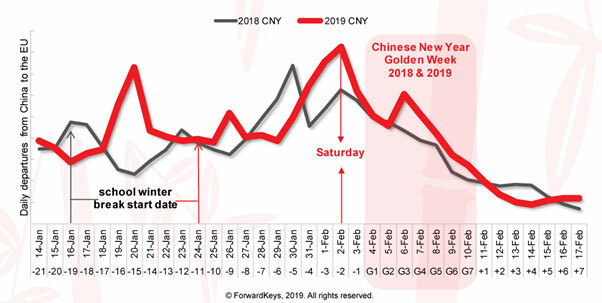 For these visitors, the ForwardKeys’ analysis of trip duration patterns shows two distinct types of holiday: either, travellers celebrate New Year with an extended visit to the EU, or they take an off-peak trip and head back to China for local celebrations during the Golden Week.